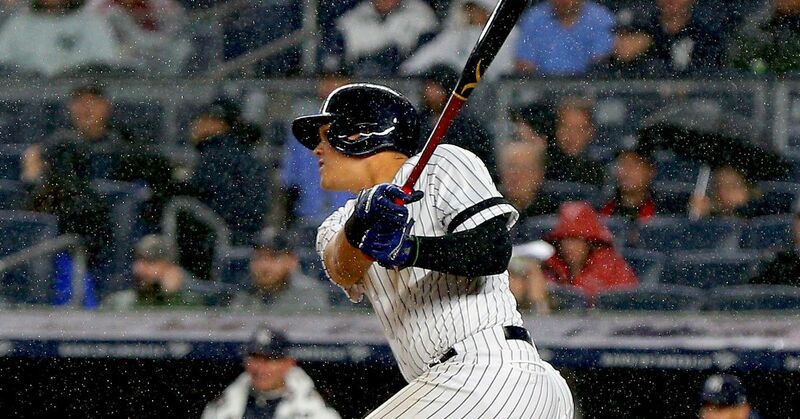 New York Yankees sluggers Giancarlo Stanton and Aaron Judge are declining to participate in this year's Home Run Derby, according to Pete Caldera of NorthJersey.com. "I don't think so," Stanton said Sunday in regard to his potential participation. "Don't want to; I've done it plenty of times. Take a year off, take two years off, if I want." "This year we've got something special going. I kind of said I'm not going...and I want to stay healthy," Judge added. Judge, who likely didn't help the left shoulder injury he was battling through down the stretch last year by participating in the Derby, said he did it last season for the fans. "That's really the only reason why you do it ... for the fans," he noted, per Randy Miller of NJ.com. "Put on a good show." Judge won the event last season, while Stanton was the winner in 2016. The pair have basically treated this season like a Home Run Derby, however, and Judge will start in the All-Star Game. The 26-year-old is hitting .280 with 25 homers (tied for second in baseball) and 58 RBI. Stanton, meanwhile, will be among the options for selection in the Final Vote online balloting. The 28-year-old is hitting .267 with 21 homers (tied 10th) and 51 RBI. "After a slow start, I kept pushing and I still have some more to do; it would be great to be voted in," Stanton said of the online fan ballot, per Kevin Kernan of the New York Post. "You have to keep fighting until you can't. I'm not going to have the opportunity to be here forever, so that's what I always say. As long as I can work, I will try to get better. Keep pushing." Judge also advocated for Stanton. "I got a long list of reasons why people should vote for him," he said. "Just the type of player he is. How his consistent at-bats as of late, the home run numbers. He's getting on base. He's moving guys over. He's doing all the things that warrant being an All-Star."